WWEXP600 - Wilwood EXP600 Brake Fluid - Brakeswap.com - Friction for the Win! What’s in a number? EXP 600 Plus has tested to 626 degrees F with a wet boiling point of 417 F. These numbers far exceed any DOT or SAE specifications. What’s the real test? It is true that racing fluids need to have high boiling points. It is also true that fluids need to have low moisture affinity to slow the natural absorption rate of water vapor. But the true test of any fluid is how well it resists aeration and compressibility after it has been heated and pressure cycled a few hundred times. The real test is at the track. EXP has proven to maintain firm pedal feel and quick response, long after others have failed. 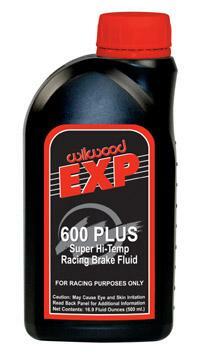 Note: For optimum performance, EXP 600 Plus should not be diluted with any other brake fluids. Add new fluid to a clean system.